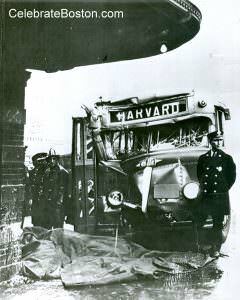 On December 6, 1944, a Boston Elevated Railway bus driver suffered a heart attack or other seizure, and crashed his bus into the old station kiosk in Harvard Square. An inspector yelled for people to get out of the way, but two women could not escape in time and were crushed to death up against the brick wall. One of the women worked at a nearby ordinance office in support of the war effort. A large oval-shaped subway kiosk used to occupy the center of Harvard Square. The building housed a waiting room, news stand, and the main subway entrance, and in those days the central island in the square allowed boarding and debarking of buses. A news wire report described the tragic accident: "Two were killed and 18 others injured and more than a score shaken up when a bus crashed into the crowd waiting at subway entrance in Harvard Sq. Wild confusion filled the Square as the screams of the injured, many of them women and children, filled the air. Elevated officials say they believe the driver suffered an attack of some kind." An AP story also described the accident: "Two women were killed and between 25 and 30 persons injured today when a Boston elevated bus crashed into a terminal in Harvard square after the bus driver apparently collapsed at the wheel. Both women were in a crowd estimated by the company at nearly 100 who were gathered in the Square, just outside the gate to historic Harvard yard, when the bus, inbound from Arlington, came in. [A Boston Elevated inspector saw the driver] collapse over the wheel, and shouted to the waiting throng. Several leaped to safety but the two dead women were pinned against the concrete terminal. Most of the injured were passengers [on the bus]. Ambulances were rushed from all Cambridge police stations and hospitals and several sped across the Charles river from Boston. The injured were taken to Cambridge City Hospital, seven of them on stretchers." During the late 1970s, Harvard Square was redesigned, and the a new surface configuration of the square was built. Vehicles could no longer drive on the west end of the square, and the old central island was widened which bottled-necked vehicles, and slowed down the speed of traffic. The new configuration reduced the risk of accidents, and added a broad crosswalk on the Harvard Coop side.